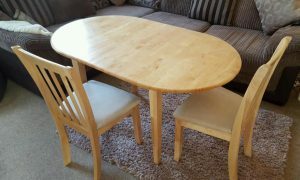 A solid pine oval extendable dining table, together with two matching high back dining chairs and a shaggy area rug. 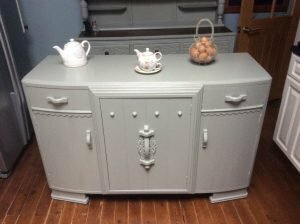 A hand painted grey solid wood sideboard dresser, having a drawer above a cupboard to either side of a pull out drawer. 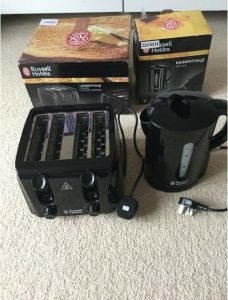 A brand new black Russell Hobbs Essentials kettle, together with a matching four slice toaster. 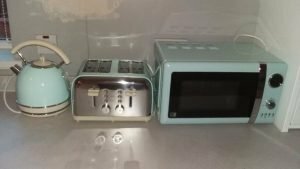 A three piece duck egg blue and cream retro style kitchen accessory set, to include a microwave, a four slice toaster and a kettle. 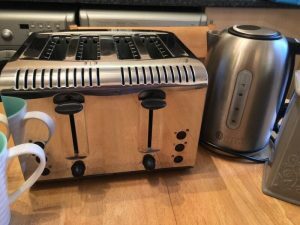 A Russell Hobbs stainless steel fast boiling kettle, together with a matching four slice toaster. 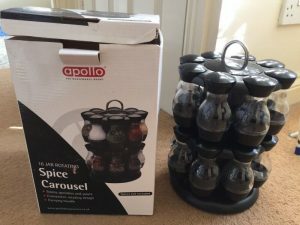 A brand new black plastic and glass rotating spice rack, together with sixteen spice jars. 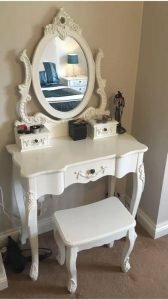 A hand painted white heavily carved vanity dresser and matching footstool, having an oval swivel mirror to the top. 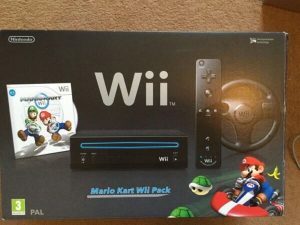 A brand new boxed black Nintendo will Mario Kart starter pack. 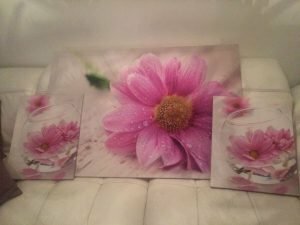 A set of three decorative wall canvases, one large canvas depicting a pink flower against a white ground and two small matching canvases. 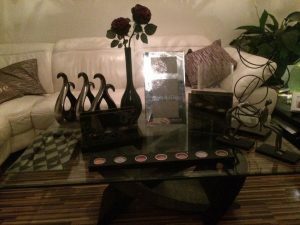 A collection of decorative home accessories, to include a tall standing triple mirrored photo frame, a black vase with faux roses, three silver ornaments, etc. 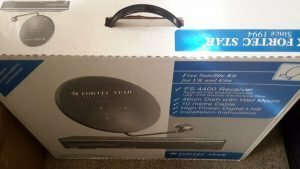 A brand new boxed Fortec star satellite receiver and dish with wall mount. 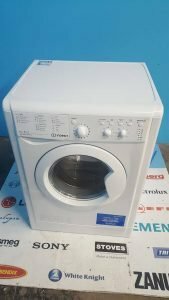 A white Bosch under counter 1400 spin 6kg washing machine. 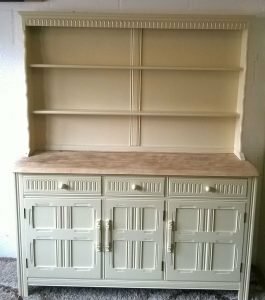 A tall standing hand painted cream kitchen dresser in the shabby chic style, having two plate shelves above three drawers and three cupboards. 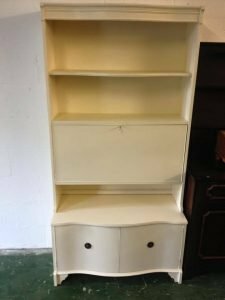 A hand painted cream tall standing shelving unit, having one shelf above a pull out shoe cupboard and a double cupboard to the bottom. 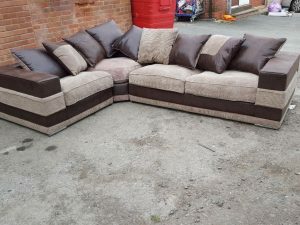 A four seater left hand low back corner sofa, upholstered in chocolate brown faux leather and stone fabric. 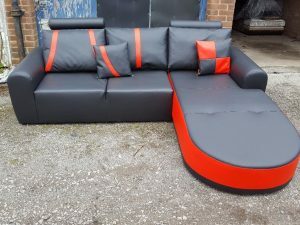 A five seater contemporary right hand corner sofa with neck rests, upholstered in orange and black faux leather. 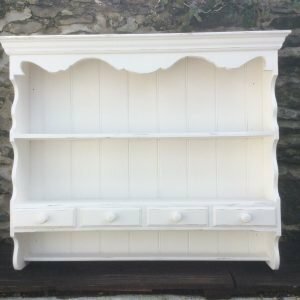 A hand painted cream solid pine wall mountable shelving unit, having one plate shelf above four small drawers. 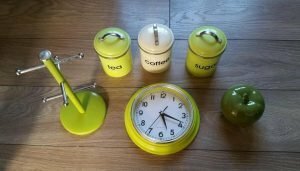 A collection of lime green kitchen accessories, to include a circular wall clock, a mug holder, an apple shaped timer and tea, coffee and sugar canisters. A collection of lime green kitchen accessories, to include a four slice toaster, a kettle, a kitchen roll holder, a mug holder and mugs and ceramic cook letters. 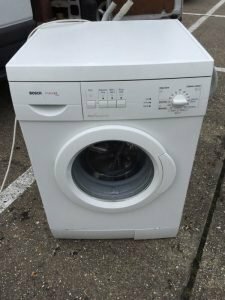 A white Indesit under counter 6 and 5 kg washing machine and dryer.